As seen through the windscreen of my pick up truck. 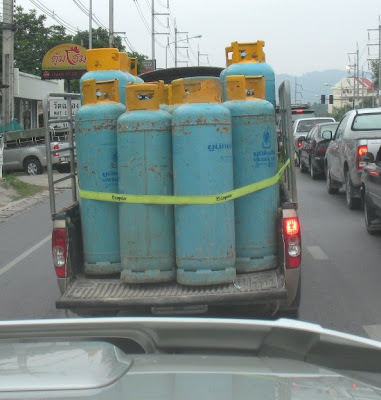 One strap holding in a whole truck full of gas cylinders. Tail gate open to pack in as many as possible. When the traffic light turned green, I kept as far away as possible. I sometimes feel like that giraffe in Madagascar "I just saw 26 blatant traffic code violations". You just have to live and learn... In England this pick up truck would be stopped by the first copper to see it. Not here!